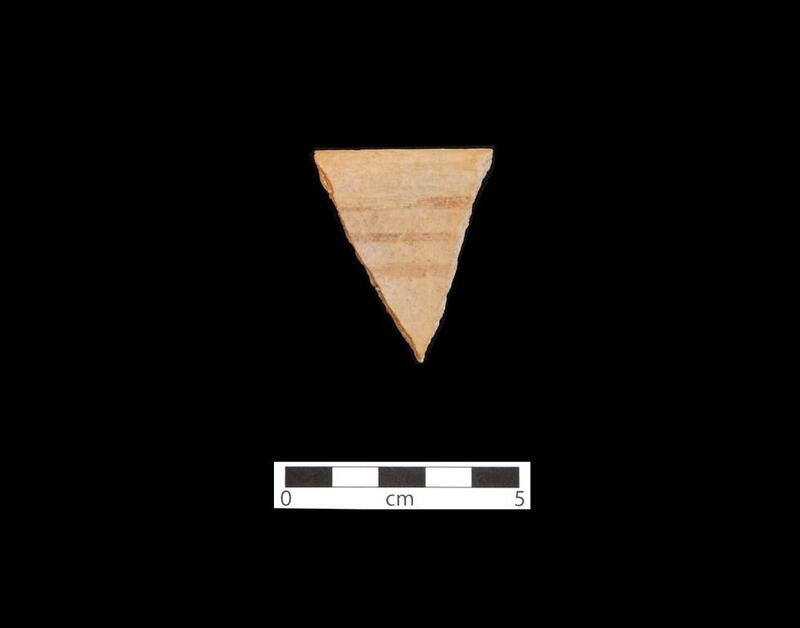 Tsegi Polychrome sherd. Click the image to open the Tsegi Polychrome gallery. Tsegi Polychrome is a type of Tsegi Orange Ware recorded only in the Tsegi canyons of Navajo County, Arizona. Date Range: A.D. 1225 to 1300. Core Color: Gray to pinkish. Temper: About equal amounts of quartz sand and crushed sherds; temper is noticeable on surfaces and sometimes conspicuous, especially on worn or polished surfaces. Surface Finish: Usually somewhat bumpy, sometimes polished; scraping and polishing marks often invisible but sometimes conspicuous; compacted or polished; no slip. Surface Color: Orange; surface and core usually do not contrast. Vessel Thickness; 4.3 to 5.9 mm. Pigment: Red is iron oxide. Design: Interior bowls have four narrow black lines encircling vessel just below rim; exterior red stripe below rim; red rim.